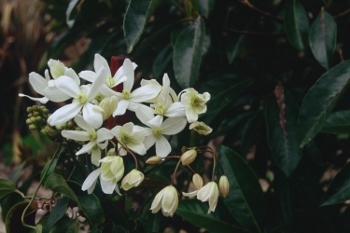 Joy Creek Photo Archive (c) all rights reserved This is the form of Clematis armandii sold in Japan that we received from our friends Kazushige Ozawa and Mikiyoshi Chikuma. It is truly different from forms like 'Snowdrift' and 'Apple Blossom.' The evergreen, lance-shaped leaves are long and much narrower than those two forms. When the new foliage emerges it is red bronze not bronze. The flowers also are distinctly green white and a little more than half the size of those of 'Snowdrift.' Fortunately, they are plentiful and more than make up for their diminutive size. The perfume of the flowers is also unique with a brighter, sharper fragrance in the early spring air. Groom after this has bloomed in spring.